I am final year graduate Computer Science student who is one among the three students from Loyola University Chicago who is involved in Mapping for justice project with Cabrini Connections. We are currently mapping Banks and their locations as our assets, to help T/MC in finding out valuable resources as part of our project. To start with, we have been collecting bank data from various resources for Geocoding it in our maps in the future. As I have mentioned earlier the three students working on this project are Peter Hoy, Brad Drury and Alexander(me). We are being assisted by our mentor Prof. David Treering who is a GIS specialist and also a faculty at Loyola University Chicago. He has given this exposure for us to serve our community in a better way as a part of our curriculum. Here is a sample of the type of map you are going to see at the Mapping Solutions gallery at Webster's Wine Bar on November 17, as part of international GIS Day. 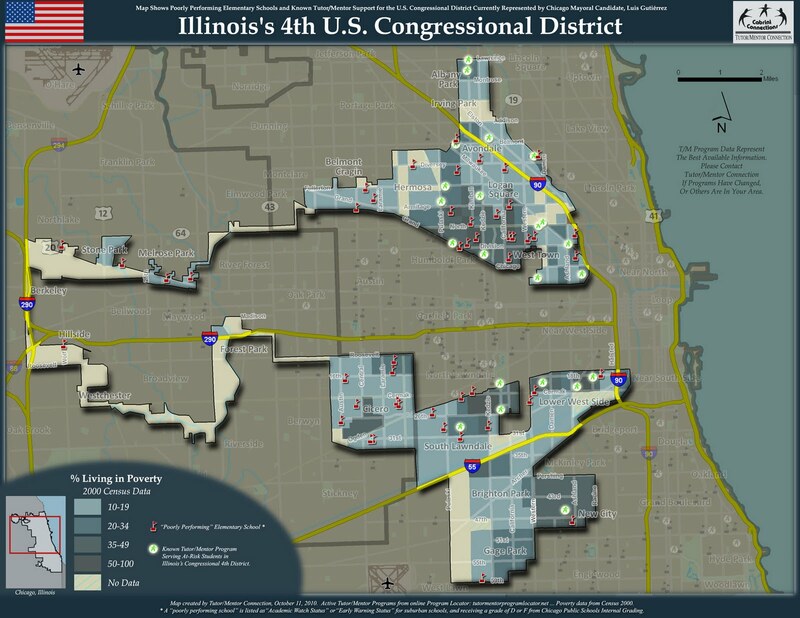 Luis Gutiérrez currently represents Illinois's 4th U.S. Congressional District. He will soon be running for mayor of Chicago. He is one of several politicians (with the power to build support for tutor/mentor programs) that will be featured in our Mapping Solutions gallery. Then click here for a detailed look at why this should concern you, and what politicians like Gutiérrez can do to take the lead in saving us money, protecting our streets, and guiding our future neighbors through tutoring/mentoring. Come out to the event, talk with us, and see similar maps. 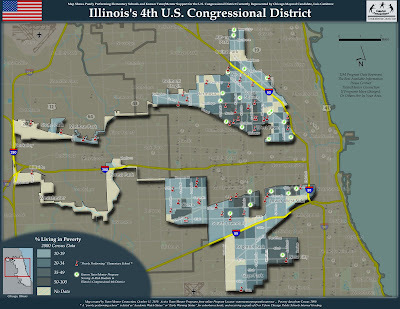 And please click here to contribute a small donation so we can continue Mapping Solutions to poverty, crime, and the drop-out crisis for our politicians. 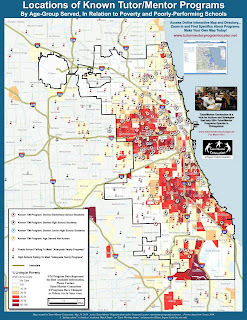 Tutor/Mentor Connection is a Chicago non-profit that helps connect business leaders, politicians, educators and citizens with afterschool and tutor/mentor programs, in part through a series of web-based maps. Using technology donated by Esri, our maps chart instances of issues like crime, violence and failing schools against the prevalence of afterschool and tutor/mentor programs. By showing this relationship, we want to create connections between at-risk students and business leaders, politicians, educators and citizens who are willing to help. We are raising money this fall to continue and improve our map capacities, to build new support for students through tutor/mentor programs, and to forge new alliances among community leaders who want to help. Additionally, this year, we are hosting a map gallery , entitled Mapping Solutions , on Wednesday, November 17 2010 to draw support to GIS Day by displaying our unique maps for the general public, business and political leaders. Maps will be on display for purchase starting Monday, November 15 to Sunday, November 27. The fundraiser event will take place on Wednesday, November 17. Webster Wine Bar , 1480 W. Webster Ave, Chicago, IL 60614. In this day and age, maps can show a lot more than how to get from Point A to Point B. By mapping the geographic relationship between social issues in Chicago and their critical solutions, we want to show where our community has opportunities for Chicago leaders to make a difference in the lives of at-risk children. Please consider a donation, and try to come out on November 17 to see for yourself how Tutor/Mentor Connection is Mapping Solutions. Mapping Solutions is one of the things that Tutor/Mentor Connection does everyday. Can you help? Where do poverty, violence, school performance and community support intersect? Our maps can show you.